Northern Territory Airports is pushing Virgin Airlines to provide a Brisbane-Alice-Perth route to improve connections to international flights, as the bulk of Alice Springs Airport passengers are heading for international destinations. The push follows an increase in Virgin flights between Darwin and Adelaide via Alice. These are now daily during the week, although the route operates only one way on Tuesdays and Saturdays. Virgin flights between Darwin and Adelaide are on a mix of Boeing 737 and Fokker 100 (F100) aircraft. 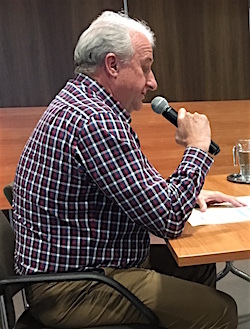 In all the capacity is up by only 96 seats per week, but already there is downward pressure on prices, said Dave Batic (left), General Manager of the Alice Springs Airport. He reported Virgin’s price from Alice Springs to Adelaide yesterday as $100 cheaper than the Qantas flight’s. NT Airports had worked closely with Tourism NT to get this increase. They are now putting together a significant marketing package on behalf of Virgin – part of getting “the deal over the line”, he said. Mr Batic’s presentation to the Town Council last night was the only part of the meeting to go ahead, after a quorum was not reached. “From an Alice Springs community perspective this is a step forward,” he said. The cost of air travel out of Alice Springs was a major issue raised during the ABC’s recent Q&A forum in town. Mr Batic also spoke to council about the fate of the local RSL, of which he is the president. Its club operations were liquidated in late June and legal advice is being sought on whether the sub-branch needs to reconstitute as an association. Meanwhile, the committee is seeking a long-term solution for the storage of its memorabilia (temporarily stored at a department of Business facility) and a base from which to continue its advocacy and welfare work for veterans. Mayor Damien Ryan asked CEO Rex Mooney to look into the possibility of the former Tourism Information Office premises being used for this purpose. Located on the Civic Centre block, the building is owned by the NT Government and has been vacant now for some years.